As they walk away, I see them head straight to the treadmill and jump on. 45-minutes later they are still strolling along in their “fat burning zone” when the reality is they should have been done with their “cardio” 39 minutes ago. The truth is, to finish off a workout right… You only need 6-8 minutes (sometimes even as little as 2-4 minutes). The key though, is you must make these last couple minutes of your workout count. What do I mean? I mean that these final minutes, the encore of your workout, should be the most intense part. Repeat as many rounds as possible in 5-minutes, and BOOM… You are done and will be exhausted! When you push your body hard and work near your anaerobic threshold, you are literally forcing your body to burn fat. And most times, you are burning that fat DIRECTLY from your belly. In a study done by The European Journal of Applied Physiology, researchers took 25 sedentary and obese individuals and had them do either low or moderate intensity workouts for 16-weeks. Over the course of the study they trained 3-times per week for 30-minutes (90-minutes a week). So although these individuals spent 90-minutes a week working out (over 24 hours through the course of the study), they saw zero results in body composition. That right there should show you that there is a much better way… Super short, intense bursts of exercise is what you must focus on if you want to get the kind of results you want from your cardio training. Strength Training: I like mixing in some sprints with my strength training just like on the Superhero Body Plan. Finisher: 2-8 minutes of super intense exercise that will leave me on the floor afterwards. It’s simple really. However, thats what the best workout do… They keep it simple and bring crazy good results! Here’s the thing… I know someone who lost OVER 100 pounds using these mini-bursts of exercises at the end of his workouts. 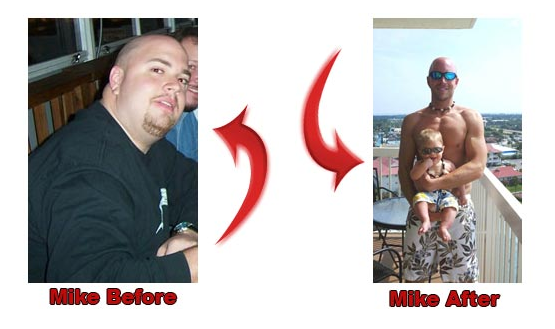 The key was that Mike kept his workouts short and intense, forcing his body to burn more fat in LESS time at the gym. And let’s be honest, if Mike (who you will find out LOVES pancakes) can lose 105 pounds… What is holding you back from losing 10 or 20 or 30 pounds? Dennis, thank you for your post. I think you are doing a great job with this website. Hopefully one day I get the chance to meet you. You are like a celebrity here in Long Beach, and if almost 500,000 people love you here, then you are well on your way to stardom. Keep up the good work!!! !